If you’re lucky enough to find time for a dinner in Everglades, those same seasonal beets might be pureed and blended with fresh herbs and olive oil, then served on the side of, say, a tender filet mignon. The Rosen Centre’s chefs cook with seasonal food as often as possible. The hotel’s suppliers know the chefs want fruits, vegetables and proteins as they hit their peak, and locally raised crops when possible. Beets and arugula are only the start of it. As winter turns to summer, Florida waters are rich with pompano and redfish. As you discuss business with colleagues at a seated dinner, you might be served the Florida fish with a golden saffron sauce or an intriguing fennel cream. In the restaurant Harry’s, the chef might grill the redfish and serve it with artichokes, asparagus and porcini mushroom sauce, while the Everglades chefs might serve the pompano as a fillet with orzo ragout and a slightly spicy cucumber salsa. Florida berries, rhubarb and watermelon are exceptionally good in May, so expect to find them creatively added to your event desserts. For berries, fresh compotes are a big deal at Rosen Centre. The chefs will warm up the berries in a sauté pan with a bit of butter and a dose of Grand Marnier, the orange liqueur. The resulting compote might find its way onto the top of a housemade cheesecake with a dash of lemon zest, or crème brûlée with a burnt sugar crust, at your event meal. You may want to return to the Rosen Centre for Mother’s Day, because then those berries will be cooked with the raspberry liqueur Chambord for the dessert buffet table. Like bread pudding? The berries are often baked right into the buttery, rich, bready desserts, then topped with fresh whipped cream. These are especially popular at conferences and conventions. Rhubarb rarely stands solo, but that’s okay. The pastry team may cook it as they would a compote, then mix it with apples and bake it into a tart with a flaky crust. “Add a little cinnamon, a little sugar, a little vanilla, and it’s delicious,” Chef Rumplik says. 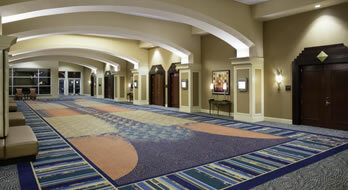 Get excited about your event at the Rosen Centre. You’ll eat well, and seasonally for sure ­– both at official gatherings and in the restaurants. Spring forward, indeed.